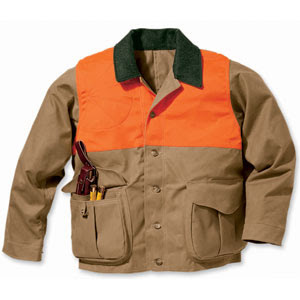 A great piece of clothing alludes to an even better idea. The thin wool and simplicity of Pea Coats allude to the classic look of seamen. The waxed cotton Barbour Cowan Commando Jacket was worn by British paratroopers in WWII. The famous Red Wing 875 boot alludes to the simplicity and purity of the American workman. The ruggedness and precision of a Rolex Submariner conjures images of an intense diving lifestyle. A good pair of equestrian boots references an exclusive pastime now engaged in by the wealthy. Although relatively expensive, these articles of clothing give everyday people the image of an exclusive lifestyle without the work or the dirt. Hunting will always be cool. Few pastimes are more rugged or more American than hunting. 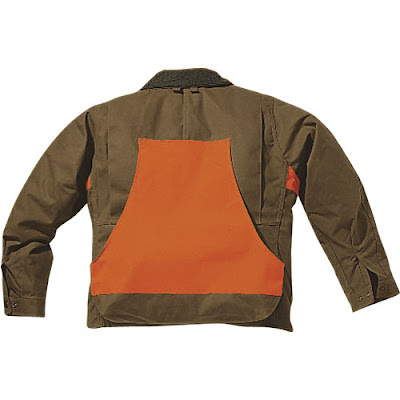 A Filson Tin Cloth Hunting Jacket With Blaze Orange details typifies the appeal of clothing representing an exclusive pastime by offering both the appeal of a heritage brand and the practicality of hunting gear.